Here’s a super simple mocktail you can whip up for your friends and family for this Labor Day or any other party. This drink is especially great for events involving grilling out or al fresco dining. 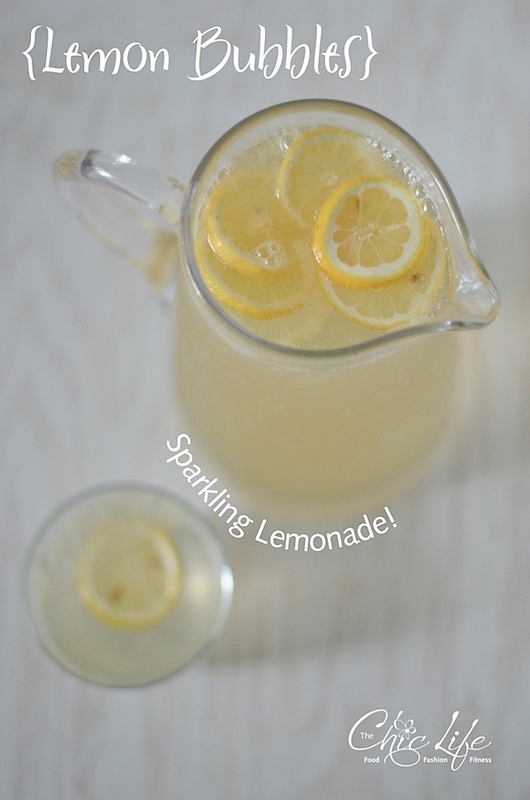 I give you an Easy Sparkling Lemonade Recipe. This Easy Sparkling Lemonade (aka Lemon Bubbles) drink reminds me of something I always wanted to try when I was in school – Lemon (or Citron) Pressé. I remember reading about this drink in French classes throughout high school and college. They seemed to like to feature it in the text and graphics of my French class textbooks. I also remember trying to find this mythical drink when I was actually in France on an exchange, but I never did. Perhaps they only serve it in spring or summer. I went there in the winter. When I was whipping up this cocktail, I hadn’t even noticed the correlation between the two. 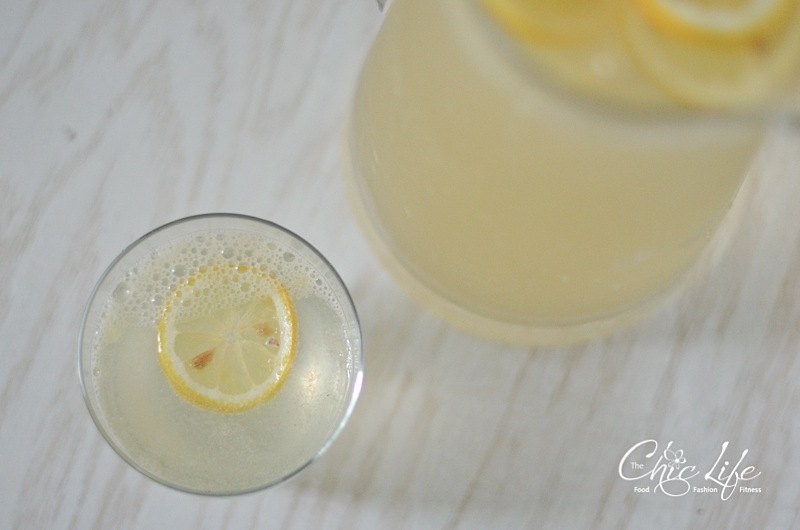 But, the Lemon Pressé popped into my head shortly before I wrote up this blog post. My drink is made with just a little sugar and sparkling water instead of flat water. I also went ahead and turned the sugar into simple syrup for easier mixing. As for it being “lemonade,” I’m not even sure I’d really consider this drink a true lemonade. I consider it more like lemon-scented sparkling water. But, I made it for some friends who came over for a pot luck recently, and they said it tasted like lemonade, so there ya go. Sparkling Citron Pressé, Sparkling Lemonade, Lemon-Scented Water…whatever you want to call it, it’s light, refreshing, and great for entertaining. Add some mint for a little extra flavor and a punch of green. This mocktail is lightly sweetened and light on the lemon flavor. If you want more of a true lemonade flavor, you may want to add more fresh-squeezed lemon juice till it tastes to your liking. Lemon slices make a great garnish. A sprig of mint will add color and flavor. Enjoy this outside with friends over BBQ chicken, grilled tofu, or fresh-off-the-grill hamburgers. 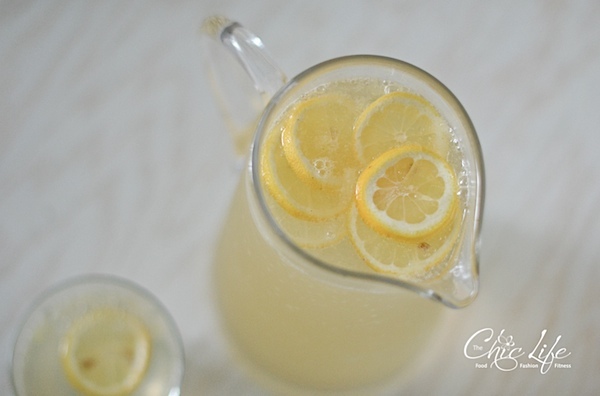 In a pitcher, add fresh-squeezed lemon juice, sparkling water, and simple syrup. Add lemon slices and let drink chill in the refrigerator until you’re ready to serve. Serve with a lemon slice in each glass. Add a sprig of mint for more garnish, color, and flavor. This recipe is super fast if you have simple syrup ready to go. If you don’t, it’s very easy to make. Just make sure it cools before continuing with the rest of the recipe. Combine and stir together 1 cup of sugar and 1 cup of water in a medium sized pot and turn stove to medium heat. Bring to a boil. Lower heat to simmer and cook for 10 minutes. Let cool 30 minutes to 1 hour in the pot. Remember, you can get more content by following The Chic Life on Facebook, twitter, or Instagram. Thanks for stopping by! I love sparkling lemonade! Tastes like a party, even when it is casual. 🙂 With it being so hot & humid here in Charleston, we have been making a lot of lemon ‘shake ups’ lately. Just this week I started making mine with just enough water to shake with the lemon juice and sugar then topping off with sparkling water as opposed to still water. YUM!! Happy Labor Day. Your lemon ‘shake up’ sounds fun! And refreshing! 🙂 How about an apple cider shake-up for the fall? I really want to make it!